DBInputTable unloads data from database using JDBC driver. 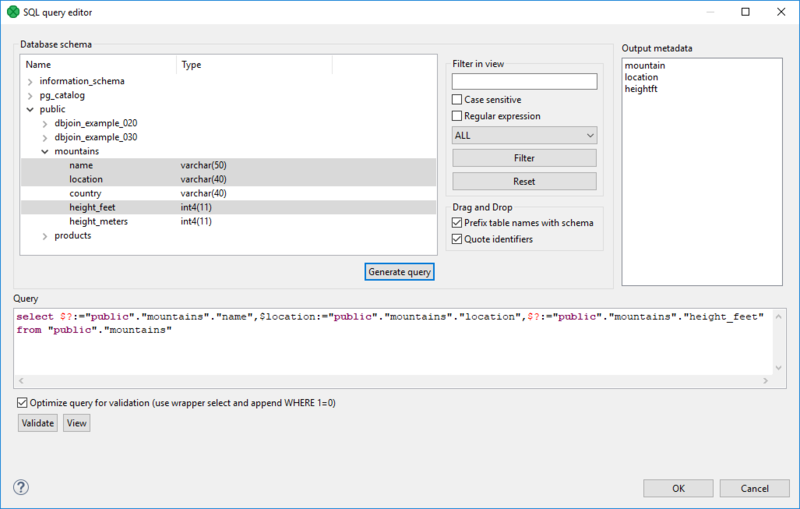 Incoming queries to be used in the SQL query attribute. When the input port is connected, Query URL should be specified as e.g. port:$0.fieldName:discrete. See Reading from Input Port. DBInputTable does not propagate metadata. DBInputTable has no metadata templates. The SQL query defined in the graph. For detailed information, see SQL Query Editor. Query URL [ 1] The name of an external file, including the path, defining the SQL query. Encoding of an external file defining the SQL query. Data policy Determines what should be done when an error occurs. For more information, see Data Policy. The name of the file storing the incremental key, including the path. See Incremental Reading. A variable storing the position of the last read record. See Incremental Reading. By default, your SQL queries are committed immediately. If you need to perform more operations inside one transaction, switch this attribute to false. [ 1] At least one of these attributes must be specified. If both are defined, only Query URL is applied. [ 2] Controlled data policy in DBInputTable does not send error records to the edge. Errors are written into the log. [ 3] Either both or neither of these attributes must be specified. DBInputTable unloads data from a database table using an SQL query or by specifying a database table and defining a mapping of database columns to Clover fields. It can send unloaded records to all connected output ports. For information about how an SQL query can be defined, see SQL Query Editor. A single dollar sign in a table name must be escaped by another dollar sign; therefore every dollar sign in a database table name will be transformed to a double dollar sign in the generated query. Meaning that each query must contain an even number of dollar signs in the DB table (consisting of adjacent pairs of dollars). When connecting to MS SQL Server, it is recommended to use jTDS driver. It is an open source 100% pure Java JDBC driver for Microsoft SQL Server and Sybase. It is faster than Microsoft's driver. For defining the SQL query attribute, SQL query editor can be used. On the left side, there is the Database schema pane containing information about schemas, tables, columns, and data types of these columns. Displayed schemas, tables, and columns can be filtered using the values in the ALL combo, Filter in view text area, Filter and Reset buttons, etc. You can select any columns by expanding schemas, tables and clicking Ctrl+Click on desired columns. Adjacent columns can also be selected by clicking Shift+Click on the first and the last item. Then you need to click Generate after which a query will appear in the Query pane. A query may contain question marks if any DB columns differ from output metadata fields. Output metadata are visible in the Output metadata pane on the right side. You can also type a where statement to the query. The buttons underneath allow you to validate the query (Validate) or view data in the table (View). By generating a query in DBInputTable, read the name, location and height in feet of mountains from the MountainsDB database. Use the DB connection and SQL query attributes. DB connection See Creating Internal Database Connections. 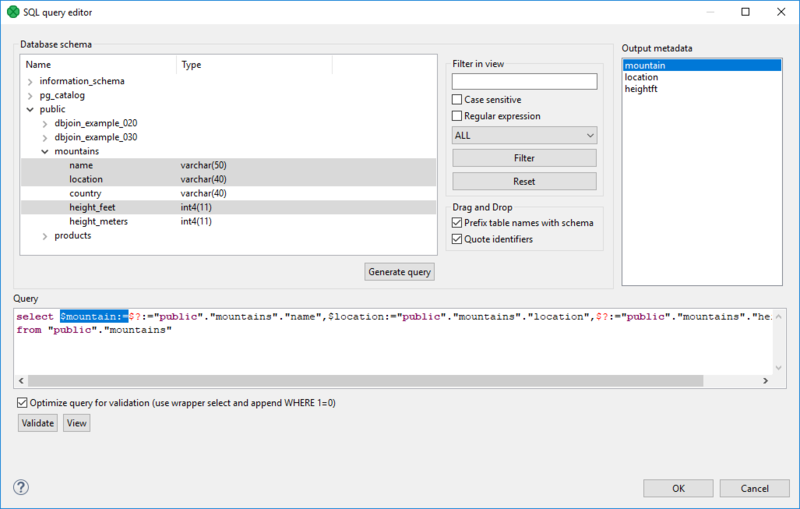 SQL query Use the Generate query button in the SQL query editor. In the output metadata, create the name, location and heightft fields. Set their data types to string, string and integer respectively. Click on the SQL query property and open the SQL query editor. Select the MountainDB database in the Database schema pane. Select the mountain, location and heightft fields and click the Generate query button. If the output metadata fields have different names and/or data types, the generated query will contain question mark(s). See SQL Query Editor. You can modify the generated query by adding other keywords, e.g. ASC, DESC, etc. You can validate the generated query and view the results by clicking the respective buttons in the lower left side of the SQL query editor. Set the File URL path of the FlatFileWriter to the external file. A query is automatically generated into an external file. Read the query from the file and write the results into another file. Use the DB connection and Query URL attributes. Set the File URL path of the FlatFileReader to the external file containing the query. According to the table above, set the DB connection and Query URL attributes of the DBInputTable. Set the File URL path of the FlatFileWriter to an external file of your choice. Input metadata should contain one field in which the query will be written. Output metadata should contain a number of fields equivalent to columns selected in the query. Make sure that the EOF as delimiter property in the input metadata is set to true. DBInputTable can only read one query per source file. Incremental Reading allows you to read only new records from a database. This can be done by setting the Incremental key and Incremental file attributes, and editing the Query attribute. Read the records, then add a new record to the database and run the graph again reading only the new record. In the output metadata, create the id, date, firstName and lastName fields. Set their data types to integer, date, string and string, respectively. [a] Follow the instructions in Incremental Reading to create the Incremental key and edit the Query attribute. If the Query URL attribute is used, we recommend to explicitly specify Query source charset.